Moonlight is the dark horse that could upset 14 time nominee La La Land at the Oscars this year for Best Picture. A lot of people are championing this coming of age tale which represents a new form of African-American masculinity onscreen and is an emotionally moving character study and performance piece. I went in excited by the high praise given by others to it but I left applauding the heart and soul put into the film by its makers but not necessarily moved in my heart and soul as much as I had hoped. The most moving scenes may be at the beginning where a young boy named Chiron (Alex R. Hibbert)is being bullied by schoolmates while his mother Paula (Naomie Harris) works shifts as a nurse and is starting to take drugs and have strange men around their apartment. Left to fend for himself, a drug dealer named Juan notices him one day and befriends him. Why he feels compelled to do this is only hinted at but he is played by Mahershala Ali whose performance looms over the rest of the film. He is the only positive male figure the boy nicknamed Little will ever have teaching him how to swim in one beautiful scene of the boy being cradled in his arms amongst the waves. This is a hard man who shows this boy nothing but gentleness, the most obvious answer to why is he immediately recognised something in Little of himself and wants to protect the innocence he has lost but this man is a criminal and there are limits to what he can do. Perhaps we’re all protective of children and their fragility, there is a scene where Chiron asks what a certain word his mother called him means and it kind of breaks your heart. The second act is about Chiron’s (now played by Ashton Sanders) sexual awakening and a pivotal moment in his life where he reaches a fork in the road and decides on one path. One of his only friends from the first act Kevin (originally Jaden Piner and now here Jharrel Jerome)is still friends with him here as he is being bullied by a kid named Terrel (Patrick Decile)and his mother’s drug use has escalated. When we meet him in the third act he seems destined to follow the path he chose previously which offers a sense of strength but can only end up being a life half lived. Kevin (Andre Holland) calls him up from out of the blue and so Chiron now known as Black (Trevante Rhodes) meets with him, the two men now in their twenties discuss life like people much older. Decisions have given them responsibilities, limited their future choices and left them feeling stuck in very narrow existences and afraid to communicate what they truly want. One of them has broken free of the life of a criminal and the other has closed himself off to love. The third act offers no easy solutions but it leaves you feeling hopeful that the orbit of these two individuals will pull each other into happier lives for them both. 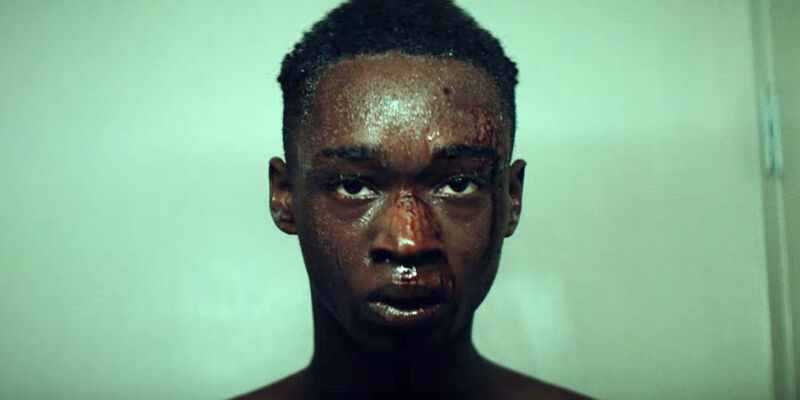 The casting of Little/Chiron/Black in this film is phenomenal, in particular Trevante Rhodes who looks very different from Ashton Sanders mimicks a lot of the facial expressions of Sanders brilliantly allowing us to see clearly the boy in the man. For a character often too shy to express himself it is an internal performance from all 3 actors and spellbindingly effective as representing the growth of someone from childhood to adult. Naomie Harris playing the mother through the three time periods shot all her scenes in 3 days and shows the nightmarish depths of an addict without becoming a caricature. Again though her best scene is maybe not with her son but her stand-off in the first act with Ali. Singer Janelle Monae is having a great award season with this and her work in Hidden Figures, here plays the most maternal figure Chiron has in his life. 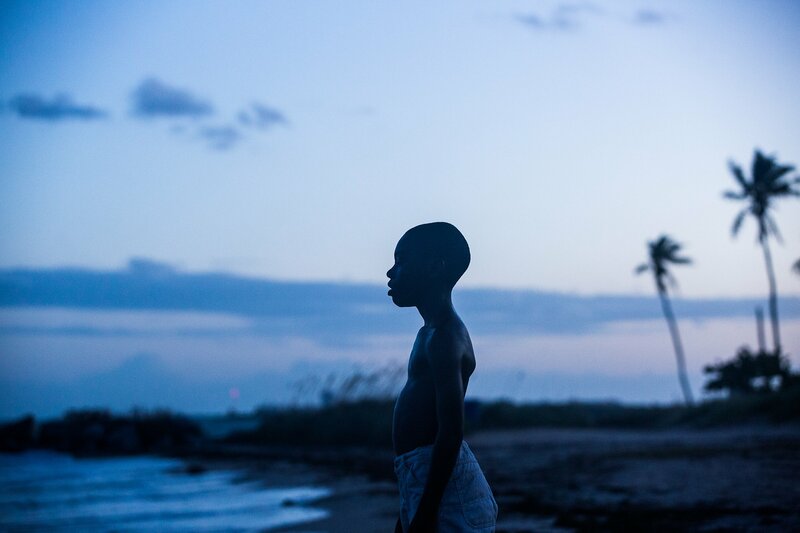 This is a passion project for director Barry Jenkins who wrote the screenplay based on the play by Tarell Alvin McCraney In Moonlight Black Boys Look Blue and honoured similar experiences they both had growing up in that time as black men in Florida with mothers who suffered from drug addiction. Jenkins builds up tension well in scenes by playing in real time with the limited perspective of an individual. We feel the danger of Juan’s work without a scene of violence just by following him on his rounds. One particular shot of Chiron when he makes a decision that will change his life is strikingly beautiful and sets up his actions with a bang. Finally the way a scene in a diner is shot at the end orientates us to the whole shop and lets the scene play out in real time as two men are now forced to say things to each other in person instead of down a telephone line and they’re terrified of what the other guy will say. I hope that’s not too vague but ten years ago there was a movie that everybody referred to as the gay cowboy movie and yes there were cowboys in it and yes they were gay but it was ultimately a tragic love story and I’d hate to see this film reduced to similar shorthand. If there is one complaint it maybe that some scenes go on too long due to the real time nature of the pacing and the film therefore drags a little for such a runtime. Some scenes are in slow-mo and I understand the reasoning behind it but think it was not always necessary. Shooting on location, sunny Miami is seen in a new light here and another particular strong point of the way the film is made is the sound design and editing which always lets us feel the world around us. Sometimes we hear the beach without seeing the water and we know the diner is emptying in third act because we can hear the bell on the door. This can be a bleak unsatisfying film for some but I ultimately left it hopeful having felt a great sense of empathy for the kind of life I’d never lived in a community I’d never been a part of. Empathy and understanding and love are some of the greatest things the arts can give us for others and for ourselves. At the end of this film I was hopeful for Chiron and I felt a great deal for him. If the film was at time slow telling its story it was no less an important story to have been told. Thanks GP, all the Awards Season releases are arriving in cinemas here in Australia. This one slipped thorough my radar without notice, so thanks for bringing it to my attention. Despite the faults you highlight, it sounds like one to watch. Like Jackie it can drag, I was hoping to respond to it more strongly in the moment but I think it will stay with me better than other films and only get richer on subsequent viewings. There’s things that are really just beautiful and required ambition and passion from all those involved to make it happen. That cdn.amproject is the key clue, Lloyd. They are using the multi-platform access, designed to make blog posts more accessible on phones and tablets. Once your post gets seen there, the views just keep coming! And 224 is a good result. I would be happy with that for some posts, I assure you. Thanks Pete that’s most kind. Well I loved Slumdog Millionaire and enjoyed the work of Dev Patel so hope to see Lion soon. Thanks for the recommendation. Best of luck with the commercial website. Is this Alan from Content For Your blog or Eddie from Jaccendo? I think it really wins by how distilled the stories are, so precise. It’s often said life’s trajectory can be shifted by a handful of moments and the approach of Moonlight certainly reflects that. Were you hopeful at the end Jay? My wife thought Chiron could do better than Kevin who called him up but wouldn’t say anything at the diner. I suspect Kevin was taken aback when he saw how much Chiron had changed. I think it’s a telling line when Kevin says he’s never been him just whatever he thought people wanted him to be. Excellent point about Moonlight making you emphasize with Chiron. I felt the same way. I also felt hopeful for Chiron at the end. It seemed that he might be able to peel back the protective layers and let someone in. The very last shot in particular suggested to me that’s what he was going to do. I hope this film has some success at the Oscars as then more people may get the chance to see it. It’s a remarkable movie. I was hoping to be blown away by it but I think I will only appreciate it more as time goes on and I did enjoy it. I really enjoyed your review of it Sean, thanks for reading mine. Great review! This was my favorite movie of 2016, and I’m begging the Academy to give it the Oscar, but I’m afraid La La Land will take it. Sadly. Very nice piece, Lloyd. You know my thoughts on this film already. It didn’t work for me and you elequently touch upon the reason why. Far too slow in parts and although the message was important and valid, the execution wasn’t. We’ve got the same complaint only the level of how it impacted our enjoyment is different. 🙂 Thanks for liking the piece Mark. Beautifully expressed review Lloyd; its interesting how many different ways you can approach this film which is a testament to its creative brilliance. I’ve described it as “a tapestry of lyrical moments and finely wrought detail in a journey for self-identity”. Thank you, the way you can assess a film is on a whole level than me.